Frozen water can wreak havoc on metal or plastic pipes, no matter their strength. According to the Insurance Institute for Business and Home Safety, a 1/8th inch crack in a pipe can spew up to 250 gallons of water a day! Harsh winter weather can take a toll on your home, most infamously in the form of frozen pipes. Historically, the coldest day of the year for the Bluegrass State falls in in mid- to late January, so that means the days of icy windshields and frost-covered lawns won't be over for quite some time. Remember that harsh winter weather can also take a toll on your home, most infamously in the form of frozen pipes. One of the unique properties of water is that it expands as it freezes. This expansion applies pressure to whatever is containing it – in this case, a home’s pipes – sometimes to the point of rupture. Frozen water can wreak havoc on metal or plastic pipes, no matter their strength. Pipes that are most susceptible to freezing are those exposed to severe cold… like outdoor hose hookups, swimming pool supply lines and water supply pipes in unheated interior areas like basements and crawl spaces, attics, garages or kitchen cabinets. 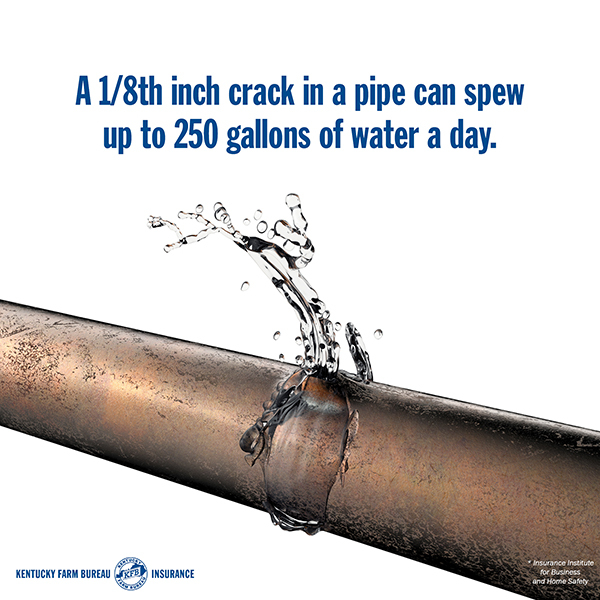 According to the Insurance Institute for Business and Home Safety (IBHS), a 1/8th inch crack in a pipe can spew up to 250 gallons of water a day! Water damage and freezing account for almost 22 percent of all homeowners’ insurance claims, averaging a whopping $4,024 per claim, according to the Insurance Information Institute (III). 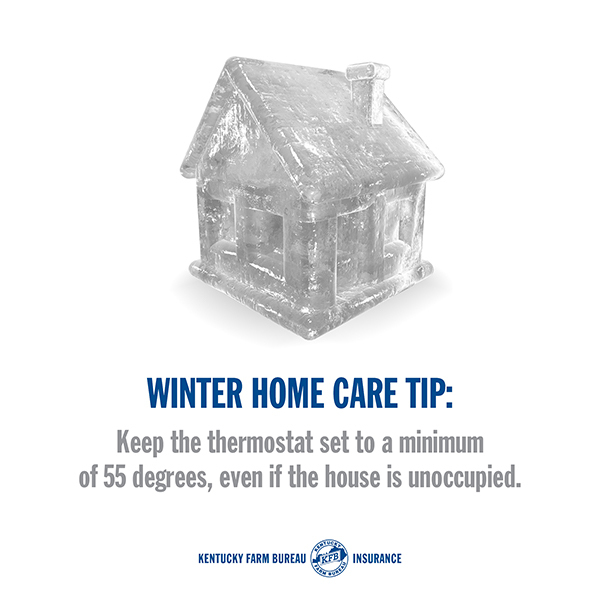 Luckily, there are several things you can do to ensure your “Old Kentucky Home” stays cozy and dry this winter season. Turn the thermostat to a minimum of 55 degrees, even if the house is unoccupied. While this preventative measure may rack up a higher heating bill in uninhabited homes, it will greatly reduce the chances of a costly repair job. If the home is going to be vacant for an extended period of time, turn off and drain the water supply prior to leaving. Turn the hot and cold water taps to a trickle. 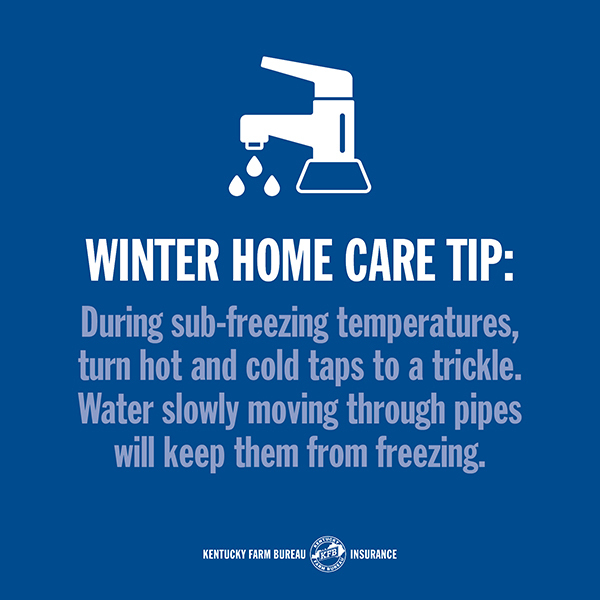 Water slowly moving throughout the pipes may help keep them from freezing. Leave kitchen and bathroom cabinet doors open to allow warm air to circulate around the plumbing. Ensure exposed pipes in the attic and crawl spaces are protected by insulation. A great, cost-effective way to insulate exposed pipes is using inexpensive, foam sleeves available at most home improvement and hardware stores. Make sure that garden hoses are disconnected and drained before the first hard freeze of the season. If water in a hose freezes and expands, it can increase pressure throughout the whole plumbing system and, in turn, burst an interior pipe. Additionally, outdoor spigot covers, like foam domes, provide a protective layer from frigid outdoor air. If you notice that pipes are frozen, move quickly! Turn on both hot and cold taps. Find the problem area. A line coated in frost or bulging like a just-fed snake is usually a good indicator. Once the frozen segment is identified, shut off the water supply to that area. Apply heat to the frozen area using towels soaked in hot water, a blow-dryer or an electric heating pad wrapped around the pipe. DO NOT use a kerosene or propane heater or any type of open-flame device! If you cannot identify the frozen area or if the area is inaccessible, immediately call a licensed professional. To be safe, have a professional inspect the pipes for damage and cracks following a hard freeze. >> At Kentucky Farm Bureau, we’re just as invested in your Old Kentucky Home as you are. 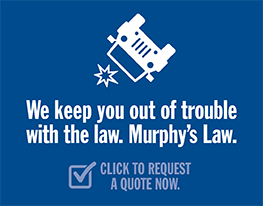 We protect what’s important to you – from farms and fishing boats to minivans and mobile homes. To see a full list of products we insure, click here.